What is a diamond cut wheel? Does a diamond cut finish last? How many times can you re cut/refurbish a diamond cut wheel? Are there different types of diamond cut wheel refurbishment? 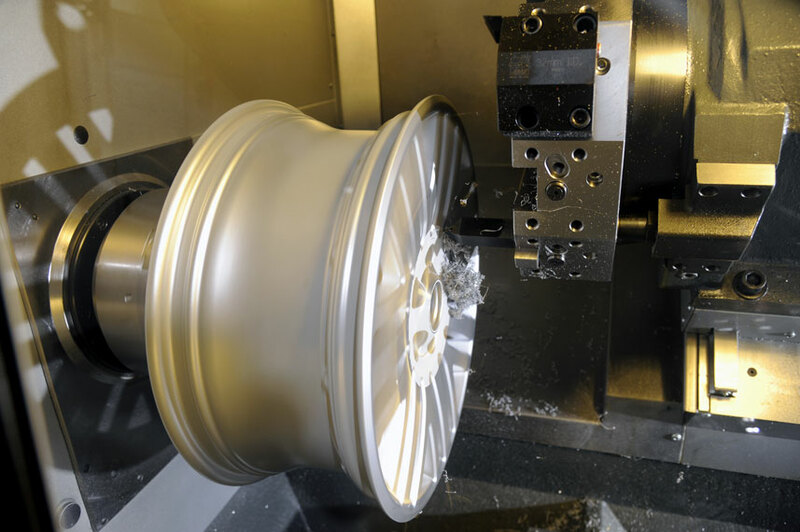 This is an alloy wheel which has been put on a lathe and part of or the entire painted surface of the wheel machined off to leave a shiny alloy finish. A small part of the actual alloy is machined off to create this finish. It is then lacquered over to prevent corrosion. You will be able to see if your wheel is diamond cut if on close inspection you see very fine lines created by the cutting machine and the appearance is very shiny. This may be harder to distinguish if you wheels are of poor quality, old or corroded. Not all wheels can be diamond cut as this depends on the profile of the face of the wheel, we will advise you if it is possible. Diamond cut wheels will not retain their finish for as long as a powder coated wheel. Any damage to the lacquer however small will allow water to seep in-between the lacquer and the alloy leaving “milky patches” on the diamond cut finish area. Always ask if you have any concerns with your wheel. Depending on the diamond cut wheel repair required this is usually 1-2 cuts, however if we feel that the wheel will be compromised in any way and weakened we will not cut the wheel and advise a Powdercoat finish for your refurbishment. Each wheel is assessed individually. It is important to inform us if you know if your wheel has been cut before. Yes there are different standards/types of diamond cut alloy repair.